MUNICH, Germany -- Ukrainian Foreign Minister Pavlo Klimkin says he will tell his Russian counterpart that Moscow must “rein in” separatists it backs in eastern Ukraine when they meet on the sidelines of a high-profile security conference. Ukrainian Foreign Minister Pavlo Klimkin. Klimkin’s comments to reporters on February 16 came on the sidelines of the Munich Security Conference and ahead of his planned meeting with Russian Foreign Minister Sergei Lavrov. 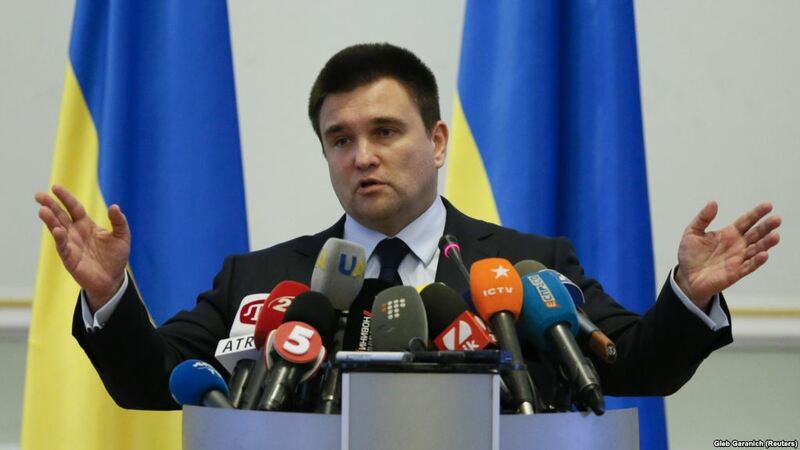 “I will tell Lavrov that they must rein in their separatist administration," Klimkin said. The war between Russia-backed separatists and Kiev’s forces will be a prominent topic at the three-day conference, which kicked off February 16 and is set to feature world leaders and other top officials. Ukrainian President Petro Poroshenko was scheduled to deliver remarks to the conference later on February 16. The Russian Foreign Ministry said Lavrov and Klimkin would meet in Munich on the same day. Conference chairman Wolfgang Ischinger said earlier that a meeting of the so-called Normandy Format -- consisting of Germany, France, Russia, and Ukraine -- would be held on the sidelines of the conference in efforts to halt the fighting between Russia-backed separatists and Kiev’s forces in eastern Ukraine. Klimkin told reporters in Munich that he would raise the issue of Ukrainian “political prisoners” held by Russia during their bilateral meeting because the issue falls outside the scope of the Normandy Format. He added that the two diplomats would also discuss a possible international peacekeeping mission to end the war in eastern Ukraine, which has killed more than 11,000 since April 2014.